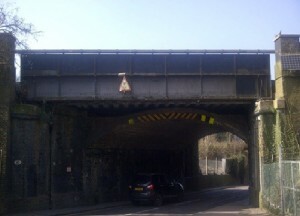 Motorists are being asked to plan ahead as work to replace a railway bridge in Purley will mean some diversions for drivers this winter.The bridge carrying the busy Brighton Main Line over Old Lodge Lane is now too old to keep carrying trains and will be rebuilt as part of Network Rail’s Railway Upgrade Plan, which will result in more reliable rail services for passengers. The project will start in earnest at the end of November, with traffic diverted around Hartley Down and Old Lodge Lane from 21 November 2016, until 9 January 2017. Network Rail’s route asset manager for the South East, Mark Huband, said: “Britain’s railways are busier than ever, with more trains on our railway, particularly on this stretch of line. As a result, we need to upgrade the bridge in Purley to keep it fit for the future and to improve the reliability of services for passengers. Pedestrian access under the bridge will be maintained throughout much of the programme. When there can be no pedestrian access – while the bridge decks are being lifted into place – a shuttle bus will carry people from one side of the bridge to the other via the road diversion.